My teacher says, “You can find a list of 3000 most frequent words in English on the internet. 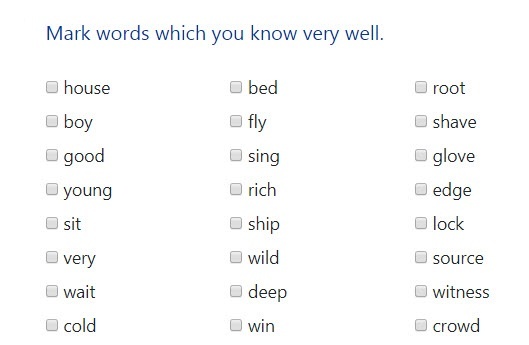 But it is difficult to learn new words from this list. These words are not connected with any story. You don’t learn what other words are connected with these words in sentences. This system works only for some words. These are basic words which describe things and people around us, for example mother, father, apple, blue, orange, dog, cat, book, car, house, city, boy, girl, water, cinema, or paper. These are words which represent something which you can imagine easily. For example, when you learn the word “dog”, you can imagine easily what it is. You have a clear idea in your head what the word means. But when you want to learn words such as “decide” or “opinion”, this system doesn’t work well. This is a problem which many students have. They start their studying with lists of words. It works at the beginning and they believe that they can learn English this way. They don’t know that when they get to the level of 1000 words, they have to start using a different system. If you want to learn words from a higher level, you have to learn them from whole sentences. If you understand the meaning of a word in the context of a sentence, you can learn the word much better. You can learn words from lists, but there is usually a limit where you can go with this way of learning, and it is 1000 words. Also, this way of learning is very slow. There are much better ways which you already know, for example reading. For beginners, the best book to read is Robinson Crusoe in simple English. You can find this book at www.robinsoncrusoeinlevels.com. It is a very good book for learning new words for beginners. There is also one interesting rule which is good to know. Every word which is important for you will come back to your life again and again. This is very similar to the way which we learn your own language. When we are children, we don’t study from lists of words. We only use the language and important words come into our lives again and again. We learn new words this way all our lives. For example, the verb “google” is a new word in many languages. We learnt this word by using the language. We didn’t learn this word from any list of words. When you heard the word “google” for the first time, you probably didn’t know what the word meant. Then you heard it again and again because the word was important for you and after some time you understood the word. After school I go to my work. I already know my work very well. Things start to be automatic. I am happy that I understand my customers. It is not very difficult because the conversations are usually very similar. Our customers want some coffee or sandwiches, so the words are usually the same or very similar. My confidence goes higher and sometimes I start to have longer conversations with our customers. It is all good but then something happens. It is a little shocking for me.